Those former militiamen from former Themata are very good with their javelins. 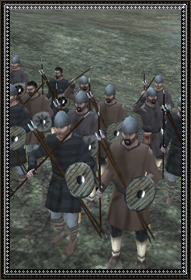 Drafted into the Roman army they are armed in just their plain clothes, a small leather or wooden shield and plain iron helmet when available, is their only means of armor. Their best protection however is to move up to the enemy fire off their javelins and back out again, before the enemy missile troops or cavalry returns the favor. Heavily outclassed by better and further shooting archers, those militiamen have to fight against unfavorable odds. Even if they aren’t the most valuable troops of the Empire, their position in the Roman battleline is vital. Used in both the preliminary phase of the battle, but also to weaken a potential breakthrough point for the heavy cavalry to charge through, Peltastai are a cheap unit, whose usefulness is much greater than its value. Historically, Peltastai were skirmishing javeling throwing troops. Not ever fighting on their own but complimenting a larger force or army. Other names for a javelin throwing unit included Akontistai and Rhiptaristai. As unit names and designations changed a lot in the era of the E.Roman empire BC takes place on, there is no absolute truth on those names and what each of those would mean at any given time. Still, historical continuity and some depictions, can give us a rough idea of what each unit would do in battle. Peltastai are the former soldiers of Themata who in decades of neglected became militia from tactical army and who honed their skills in hunting, especially dangerous game as boars. While they are useful, they are not soldiers and in the first sign of trouble, they will break. A wise commander should know this limit and not stray beyond it.